Mr. Onadele is the pioneer Managing Director/CEO of FMDQ OTC Securities Exchange. Prior to this engagement, he was the President of FDHL, a financial markets and risk management consulting firm he founded in 2001 where he provided business leadership in the empowerment of the Nigerian financial markets. He started his professional career with Coopers and Lybrand Associates, an international firm of Chartered Accountants before joining FCMB. 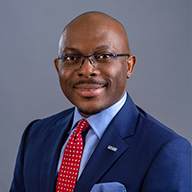 His banking career spanned across Citibank Nigeria (Chief Dealer), FCMB Limited (Treasurer), Trust Bank of Africa (Merchant Bankers) (Managing Director/CEO) and Leadbank PLC (Chief Operations Officer). He is a member of the Board of Trustees of FMDA.